SXSW 2014 Goes Wireless with Alpha Omega Wireless, Inc.
Alpha Omega Wireless, Inc., headquartered in Austin Texas, was hired for the forth year in a row by SXSW and RightRound to provide wireless Ethernet backhaul and outdoor Wi-Fi to multiple venues around Austin for the 2014 SXSW Film, Interactive, and Music Festival. President Joe Wargo says, "We were excited to be asked by SXSW and RightRound to return to help them provide critical bandwidth to their major venues and some outdoor Wi-Fi at select special events. This year we have seen a huge increase in the bandwidth requirements of SXSW and their sponsors. In years past some of the major events only needed upwards of 50Mbps, but now the minimum has been 100Mbps+. This year we have several events that need GigE bandwidth. More and more live streaming is going on this year. Overall, AO Wireless has deployed over 5Gbps+ of carrier grade point to point wireless backhaul and point to multipoint wireless Ethernet bridges. RightRound has brought in multiple multi GigE fiber internet POP’s around Austin that AO Wireless then created the last mile wireless connectivity off the fiber to the venues. I was amazed on how much redundancy that RightRound has created this year. This year because of the high bandwidth requirements we expanded multiple point-to-point wireless backhauls to concert venues and outdoor event locations. We had to use more point-to-point microwave links, rather than using traditional point-to-multipoint wireless Ethernet bridge systems because of the amount of unlicensed wireless interference. Other major accomplishments this year was providing high speed Wi-Fi, to some high profile, outdoor party events and outdoor meeting events. For the outdoor Wi-Fi applications we used Xirrus Wi-Fi array systems in order to handle the high density of Wi-Fi users and devices. 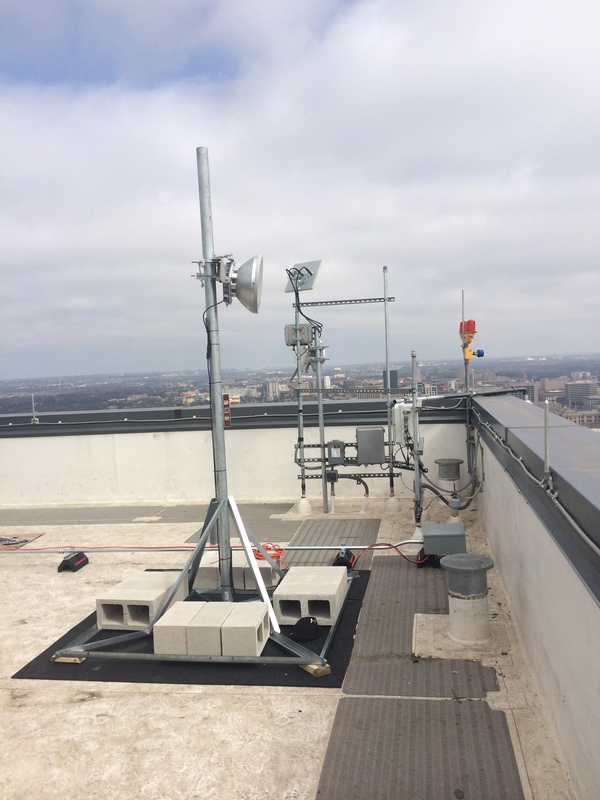 This year we used a wide variety of radio systems ranging from Xirrus for the high density Wi-Fi and Proxim, Radwin, Exalt, Siklu, and SAF Tehnika for our outdoor wireless Ethernet bridges. We used a lot of 24GHz point-to-point microwave radio links for our mission critical wireless backhauls. The SAF Lumina 24GHz radios help us avoid wireless interference and provide us 366Mbps full duplex (732Mbps aggregate) throughput. The advantage of these wireless frequency platforms was to help avoid interference. Plus they could be deployed immediately under FCC regulations. We even introduced the new SAF Integra radio for our most important venue. SXSW 2014, the world's leading music industry event, offers attendees the opportunity to explore the future of the music industry during the day at panels, talks, the Trade Show, Music Gear Expo and other conference activities at the Austin Convention Center. At night, the absolute best mix of musical performances from over 2,000 regional, national and international acts will take place at the nighttime music festival. Altogether, SXSW presents unmatched networking opportunities, career-building conference programming and over 100 stages of music for showcasing bands and conference attendees. SXSW takes place in Austin, Texas. For more information on every aspect of SXSW and to register to attend, please go to http://www.sxsw.com.